Specifically, the Code of Federal Ethics states that government employees "shall act impartially and not give preferential treatment to any private organization or individual." Pentagon ethics guidelines also call for avoiding actions that would create even the appearance of improper behavior or conflicts of interest. 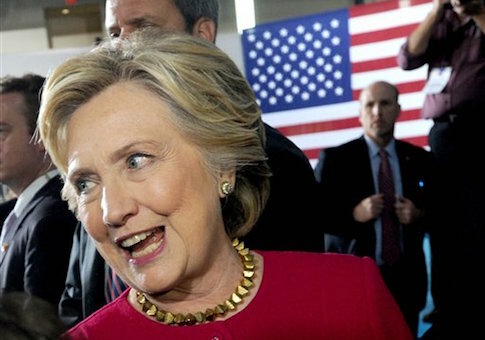 The Clinton email exchanges with Deal between 2009 and 2011 were among tens of thousands of private emails made public by the State Department under pressure from Congress and the public interest law firm Judicial Watch. An FBI investigation concluded in July that Clinton and her aides discussed highly classified information on an unsecure private email server while secretary of state. Investigators also concluded that foreign hostile actors likely hacked the emails. The Justice Department declined to prosecute Clinton based on advice from FBI Director James Comey, who argued that no reasonable prosecutor would try the case. "I met with Michele’s other deputy yesterday, and we had a productive discussion about Iran and developments in maritime Asia," Deal stated. "We also discussed contract vehicles and mapped out what we need to do so that we can go to work! I am very grateful for everything you have done." The emails indicate Deal was seeking to advance her company’s contracts with two powerful policy-making offices, the Defense Department’s main policymaking shop and the State Department policy planning office. Both offices are key players in developing U.S. defense and foreign policy. The Long Term Strategy Group, set up in 2007 in Cambridge, Massachusetts, and now based in Washington, D.C., has been producing reports and holding workshops for the Pentagon’s Office of Net Assessment for years. A series of Clinton emails beginning on May 21, 2009 reveal that the State Department’s director of policy planning, Anne-Marie Slaughter, turned down a proposal from Deal for a contract with the Long Term Strategy Group to do work for her office. No reason was given. "Happily, Michele Flournoy’s office is reaching out and has asked me to participate in a wargame next week for the [Quadrennial Defense Review], which I hope will build the foundation for a contract between her office and LTSG," Deal stated in the email. "I am extremely grateful to you for helping me find opportunities to serve our government," she added. Chelsea Clinton also forwarded an email from Deal to Hillary Clinton in December 2011 that included a link to a Huffington Post article by Deal and signed "xoxoxoxoxoxo j"
Deal, in a statement, said that none of the awards LTSG received from the Pentagon "resulted directly or indirectly from the actions or influence of Secretary Clinton." She added: "Jacqueline Deal and the Long Term Strategy Group (LTSG) are justifiably proud of their collaboration with the US Department of Defense across multiple administrations over the last two decades, beginning under the administration of President George W. Bush. LTSG’s work has consistently earned the highest respect and confidence of its clientele in government and has won LTSG a reputation for producing research and analysis of exceptional quality." Clinton campaign spokesmen did not return emails seeking comment. Slaughter, through a spokesman, said she had no recollection of contacts with Deal. Flournoy also said she did not remember discussions with Deal, but stated through a spokesman that in her government career she met with hundreds of young women seeking to advance their careers in the national security field. "I have and will continue to work with young men and women, including those recommended to me by people whose opinion and judgment I respect, such as Secretary Clinton," she said. "Whether any of the people I have met with went on to win contracts with the Office of Net Assessment or other Department of Defense entities was outside my purview as undersecretary of defense for policy," Flournoy said. Pentagon Press Secretary Peter Cook declined to comment on the emails. The Office of Net Assessment defended contract work done by Deal and the Long Term Strategy Group since 2007, and said the group has not worked for the undersecretary of defense for policy, nor has that office been involved in the contract award process for ONA contracts. Long Term Strategy Group "competes for proposed work in the same fashion as any potential contractor, which requires a rigorous, formalized process, including built-in external review by acquisition professionals within the Department of Defense to ensure strict compliance with all applicable laws, regulations, and ethics," ONA said in a statement to the Free Beacon. The statement said the Office of Net Assessment conducts "robust and innovative research" to support defense leaders. "LTSG's work has consistently informed ONA's internal analysis and they continue to be a responsive vendor," the statement said. "The firm, however, is just one of 90 sources that ONA has commissioned work from over the past decade. Good government advocates say the emails indicating Clinton sought to steer contracts to her daughter’s friend are troubling and appear to violate ethics rules. "By now there is a strong pattern of Hillary Clinton showing bias in the dispensing of government funds and favors to a long list of friends, political supporters, and Clinton Foundation donors," said Ken Boehm, chairman of the National Legal and Policy Center. "It looks like she was single-handedly trying to revive the corrupt spoils system," Boehm added. "As the old saying goes, sometimes things are what they look like." Joseph E. Schmitz, a former Pentagon inspector general, said if he were the current IG, "I would definitely want to shed some light on the underlying facts" surrounding Clinton’s intervention on behalf of a family friend. "When I was serving as the inspector general, I investigated at least one senior official who allegedly had violated the standard for ‘misuse of position’ prescribed in the Joint Ethics Regulation," said Schmitz, currently a lawyer and adviser to the Donald Trump presidential campaign. Both federal government and Pentagon ethics regulations state that "an employee shall not use or permit the use of his government position or title or any authority associated with his public office in a manner that is intended to coerce or induce another person, including a subordinate, to provide any benefit, financial or otherwise, to himself or to friends, relatives, or persons with whom the employee is affiliated in a nongovernmental capacity." Schmitz also said Pentagon regulations prohibit actions that give "an appearance of use of public office for private gain or of giving preferential treatment." He noted that the standard is something "any inspector general should be capable of investigating." Internal Pentagon documents reveal that the Long Term Strategy Group produced scores of monographs and held numerous workshops under contracts with the Office of Net Assessment from the early 2000s to as recently as July. The office is a small think tank whose director reports directly to Defense Secretary Ash Carter. The strategy group charged the Pentagon around $60,000 each for unclassified monographs averaging 20 to 40 pages in length and around $40,000 each for workshops with defense officials and think tank experts. Estimates of the total value of contracts for the group are around $6 million since 2009. One Pentagon document from May 2013 recommended awarding a contract of up to $442,788 to the Long Term Strategy Group over eight other bidders. The contract was for a two-year Office of Net Assessment study on changing demographics and family structures in China. The strategy group described itself in a contract proposal as a "woman-owned small business" that is "not partisan or policy prescriptive." One Pentagon-sponsored report by the Long Term Strategy Group was titled "On the Nature of Americans as a Warlike People," which argued "the United States will continue to use war as an instrument of state policy." The conclusion was based on a demographic and cultural analysis that said the United States is governed by many Americans descended from the Scots-Irish, who are belligerent. Another report done for Net Assessment, "War and the Intellectuals," stated that educated American elites are anti-war compared to "the rest of America." The divide between the pacifist intellectuals and uneducated Americans "could be ended if the educated elite again devote themselves to national service in return for a leading position in the conduct of American foreign policy." A third contract potentially worth $1.9 million over several years involved U.S.-Japan relations and included meetings with Japanese defense and intelligence officials regarding Japan’s development of strategic nuclear weapons and forces. The contract was controversial because both the U.S. and Japanese government have stated they do not want Japan to develop nuclear arms. Japan currently is under the U.S. nuclear "umbrella." Japanese officials, however, have said Tokyo’s pacifist constitution does not prohibit nuclear arms. Other reports and workshops by the Long Term Strategy Group concerned strategies for the Middle East, U.S. extended deterrence to American allies, Egyptian security concerns, Soviet-era radio electronic warfare doctrine, Russian nuclear developments, and Israeli relations with a nuclear-armed Iran. The Office of Net Assessment has come under fire in recent months from critics in Congress and on the Pentagon’s Joint Staff who say the office is not doing an adequate job of producing major assessments of key threats to the United States. Net Assessment Director James H. Baker in June opposed a Joint Staff proposal to create a separate net assessment office for the military. Baker explained his opposition by saying that of the "dozens" of military officers who had worked in ONA, "perhaps five could think and could write well enough that they would produce a military balance or net assessment worthy of the Secretary or the Chairman." The Office of Net Assessment has an annual budget of around $20 million and in 2013 Republicans in Congress fought off a reform effort that would have closed the office or diminished its independence. The office was led for 40 years by Andrew Marshall, who had a reputation as a strategic guru dubbed the Pentagon’s "Yoda," after the fictional Jedi leader in Star Wars. Marshall retired in 2015. However, over the past year, Baker, the current office leader and a retired Air Force colonel, has functioned more as an absentee landlord, attending conferences around the world while his deputy, Andrew N. May, has run things, according to a defense official. Last year, Carter ordered a shift in the office’s focus from long-term strategic trends to more contemporary defense analysis. The shift prompted Gen. Joseph Dunford, chairman of the Joint Chiefs of Staff, to consider setting up his own office of net assessment within the Joint Staff. According to defense officials, the strategists on the Joint Staff were concerned the civilian office was not doing enough relevant work. The Clinton emails provide a snapshot of how Clinton sought to help her daughter’s friend navigate the Pentagon. On July 19, 2009, while traveling in India, Clinton wrote to Deal thanking her for an analysis of the Chinese military buildup and asked, "by the way, did the DoD contract work out?" Two days later, Deal wrote back that "we have discussed with Mr. [Andrew] Marshall the kinds of assessments that need to be done to identify which technologies can be transferred even if there is a risk of their being compromised," Deal stated. "On the contract question, we are still working with Mr. Marshall to establish a vehicle that might allow us to do work for Michele," she stated. "When you next speak with her, if she mentions what she envisions for the start date, that would be very helpful to know!" Months later, in September 2009, Deal wrote Clinton an email that was redacted because it contained classified information withheld under security rules that prohibit releasing CIA information about agency personnel or sources. Deal stated in this email that she had completed a workshop with Pentagon officials and outside experts on Iran that concluded that any military strikes on Iranian nuclear facilities would be counterproductive. "Based on patterns of Iranian behavior in the past, there is reason to think that some diplomatic communications may serve to increase Iranian fears about the consequences of its pursuit of a nuclear capability," Deal stated, in what appears to be support for the White House’s effort to ultimately reach the nuclear deal with Iran. The last series of emails between Deal and Clinton took place in May 2011. In the email chain, Deal thanked the secretary of state for attending her wedding on April 29—one day before the commando raid in Pakistan that killed al Qaeda leader Osama bin Laden. "I was delighted to be there and stayed as long as I could at the reception before having to leave," Clinton wrote back. "I confess that the Bin Laden op the next day consumed most of my mental space!" Deal’s political views were on display in one email after Clinton asked her about President Obama’s May 19, 2011 speech on what role the United States should play in the Middle East and North Africa as a result of the Arab Spring uprisings. Deal replied that the Arab Spring created opportunities, but that there was no U.S. strategy that was "not a clumsy neocon democracy installation effort"—an apparent reference to George W. Bush administration programs to promote democracy in the Middle East. Deal then suggested creating "an elite branch of the diplomatic corps that has the attributes of the special operations forces community but is optimized for outreach rather than for paramilitary activities." Update 4:49 P.M.: This post has been updated to reflect comment from Deal. This entry was posted in National Security and tagged Hillary Clinton. Bookmark the permalink.